Our second cycle is well-underway; both bands preparing for our December 12th concert 40 Under 40 at the Grand Street High School at 7 PM. The concert will include a joint performance by Grand Street Community Band and the Brooklyn Wind Symphony of Alfred Reed's Russian Christmas Music. Kristin combined the contemporary styles of the 40 Under 40 concert theme and played off the traditional motif of Russian nesting dolls in her design. 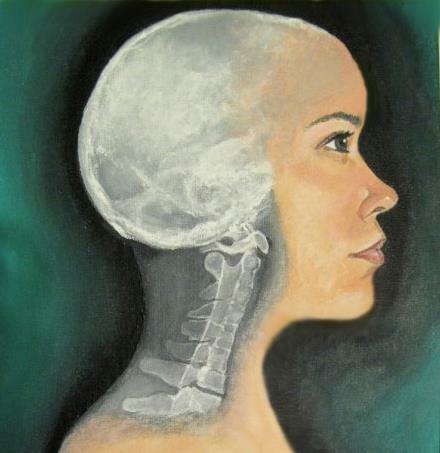 Read on for more of Kristin's thought process in creating the program art, and scroll through the slide-show to see the piece in progress, along with more of her artwork! "To get inspiration, I made a spotify playlist with every song for both bands and just put it on repeat while I was working on it. I already knew I loved Russian Christmas Music and I thought it could be fun to incorporate the themes of other pieces into the intricate designs of Russian stacking dolls. "The turning point came when I saw the name of one of GSCB's pieces is Ghettoblaster...as in the massive boom boxes of the 80s and 90s that are carried on shoulders. That brings to mind all things early hip-hop, heavy graffiti, and even heavier lip-liner. It wasn't until I was staring at my design of a chick holding a boombox that I remembered "Top 40" [music] is also a thing. There isn't one stand-out programmatic piece among a list of abstract standard repertoire, so it was hard to choose. The music itself is really colorful for both bands this cycle." "Sarah Cohen (our head graphic designer) originally asked if I wanted to contribute a photo for the cover. She left it totally up to me and even said it could be photos of tattoos I had done. I liked that idea, but I couldn't figure out a way to combine existing photos in a pleasing way or to get a group shot of band members I've inked, so I just scratched that idea and decided to draw something new. 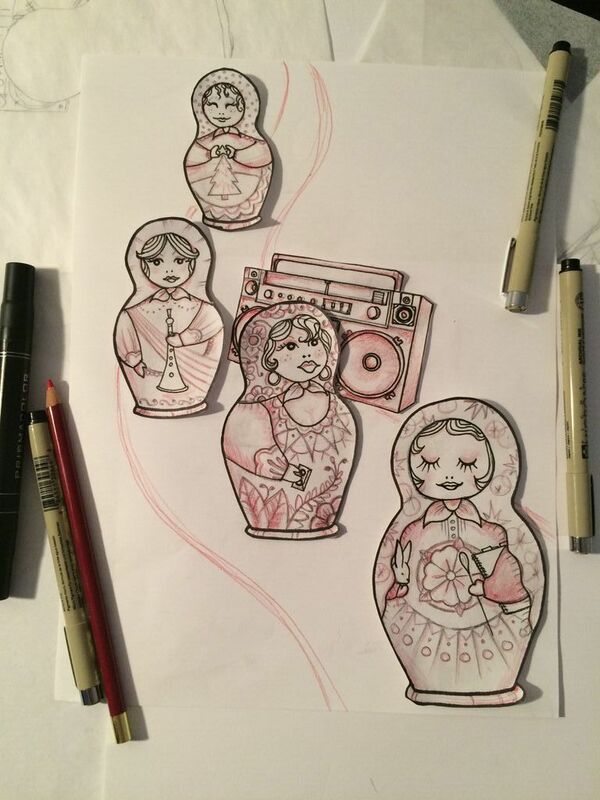 That urban graffiti aesthetic is also a common tattoo style, so turning the Russian stacking dolls into a stylized tattoo sketch seemed like a good fit. I definitely had to Google some boombox references, but then the curvy and cartoony elements were just fun." "I did that kokopelli tattoo (in the slideshow) on my former high school band director's forearm. It can be seen by all of his students and the community band he conducts. I never would have predicted that back when we were sitting in his office discussing my upcoming college auditions! And then a year after I tattooed him, he was in the audience watching [BKWS] at Midwest! It just goes to show you that you never know where life will take you!" Posted on November 18, 2015 by Alyssa Pry and tagged Artist Series brooklynwindsymphony 40 Under 40.